Vacationing on a cruise ship can be a lot of fun and the ports of call can be exciting. Stopping off in the Bahamas offers a lot of sights and experiences, and many a cruiser gets their hair done in beads and braids to carry a memento of the trip with them, at least for a little while. But some of the other booths manned by locals are being shunned- those offering temporary tattoos. Once a thriving tourist business, these places are losing out thanks to the urban legend that temporary tattoos can scar- an urban legend that happens to be correct. Tattoos are a permanent bit of body art in most situations. Needles are used to inject die into the skin, rendering images that the bearer had better be fond of. In some cases, however, tattoos can be tried out before becoming a permanent feature of the body. In these cases the tattoos are painted on the body using henna. Left to dry, henna paint will stay on the skin for a number of days, eventually fading into nothingness. But there have been reports that black henna can actually scar the skin, turning a temporary lark into a painful, permanent memory. Natural henna is not black, but rather an orange brown. 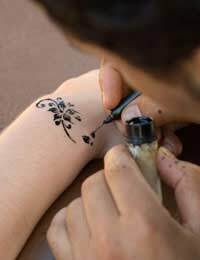 A tattoo made with natural henna can be readily identified by its color, something that caused some to wish for a more realistic tattoo experience. Thus tattoo artist began mixing colors with the natural henna, and in seeking to emulate the basic black of tattoos, mixed PPD, a chemical named Para Phenylendimaine The result is black henna die that looks exactly like a real tattoo. The problem is that PPD has been known to scar. Quite simply, people who received black henna tattoos had allergic reactions, and they or people they knew used the internet to spread the word in warning. The problem is not the henna, but rather the PPD, which some people have an allergic reaction to. This is not a mild allergic reaction, but rather redness, swelling, and even skin sloughing. What was supposed to be body art that lasted a few days may leave a permanent disfiguration, and all because the henna tattoo artists are not warning their customers. Henna is an old root that needs to be mixed with oils to become the paste needed for tattooing, and even natural henna can sometimes cause a reaction. When mixed with PPD to make black – or sometimes blue—henna, this reaction can cause a permanent change in the victim’s physiology. Even if they escape the scarring, they may be forever hyper sensitive to products that contain the chemical PPD, such as many hair dyes. This is one case were an Urban Legend was spawned by the facts, but the facts sounded so much like a typical urban legend that it attained the label. This urban legend serves as fair warning to anyone seeking a temporary tattoo that didn’t come from a rub-on transfer – beware the black henna. I use temporary tattoos a lot and I have never got a scar from them. I see people wear them all the time and they don't get scars from them. This proves that this Urban legend is false. Parents probably use this legend so children don't want to get temporary tattos.